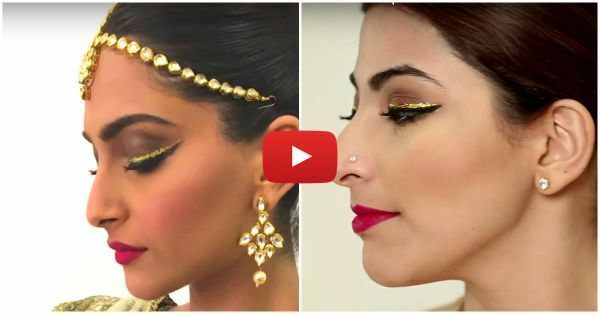 How To Perfect Sonam Kapoor Makeup Look At Home!! Get Sonam Kapoor's Perfect Base Step 1: First apply primer all over your face. This will help for smooth application of the makeup. Step 2: Now apply foundation all over your face with a stippling brush. Blend it well. Don’t forget about your neck! Step 3: Since dark circles have a bluish tone to them, the best way to conceal them is to use a peach colored concealer under your eyes. If you have a darker skintone then use an orange coloured concealer. Follow the application of the corrector with a concealer and blend it well. This will cover up the orange tone, correct and brighten the under eye area. Now apply some fixing powder under your eyes to set the concealer. Sonam Kapoor's Glitter Eyes Step 4: Using a flat brush, apply deep brown eyeshadow and create a crease along your eyelids. Now blend to avoid harsh lines. Step 5: Use a gel or liquid eyeliner to create wings. Use a business card as a stencil to draw perfect wings. Step 6: Now line the eyelid with some glitter glue along the line of your black eyeliner and follow this up with the application of some gold sparkle powder with an angled brush. Step 7: Line your lower waterline with kajal. Now apply a light brown eye shadow right under your lower waterline to soften the look. Complete the eyes with a generous coat of mascara. Get Chiseled Cheeks like Sonam Kapoor Step 8: Apply bronzer to the hollow of your cheek. Step 9: Sweep on pink blush on the apples of your cheeks with a fluffy brush. Sonam Kapoor's Makeup Tips for the Lips Step 10: Sonam is wearing a matte lip color in red with fuchsia undertones. If you don’t have the same color, you can first apply a bright red matte color to your lips and follow it up with the application of a deep pink lipstick to create her colour. Use a lip brush to make the application precise. MUST-READ: How To Make Pretty Braids Like Alia Bhatt’s – At Home! MUST-READ: 5 Super Easy Beauty Hacks Every Girl Needs To Know!